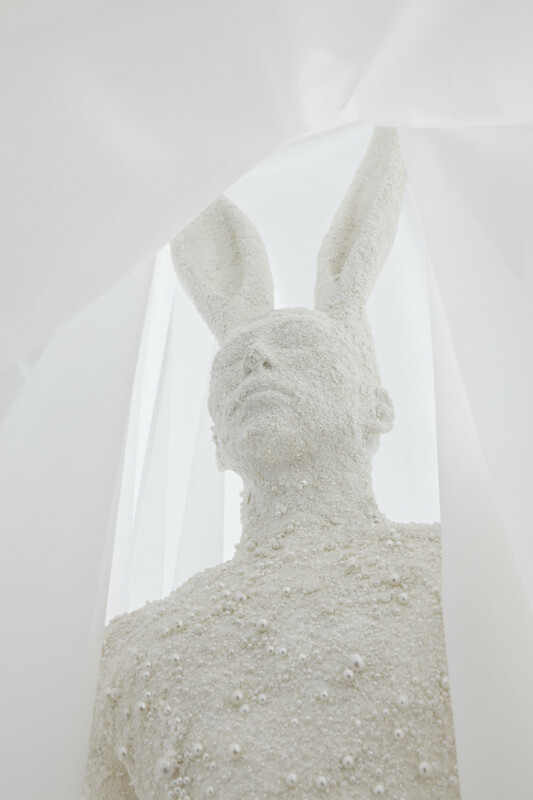 The following is an email conversation with Terence Koh about his 2008 sculpture, “Boy by the Sea,” which depicts a perfect mirror image of Terence Koh’s body at 2/3 size, with bunny ears, and covered with 65,000 faux pearls. In making the work, Koh had his body scanned three-dimensionally, and, using the resulting data, was able to reproduce an exact replica of his body in the size he would have been as a boy. 1. A few years ago, you made a drawing of a boy by the sea. Is it the same boy as your drawing (of you?) by the sea from many years ago, only to finally gain human/Kohbunny form? 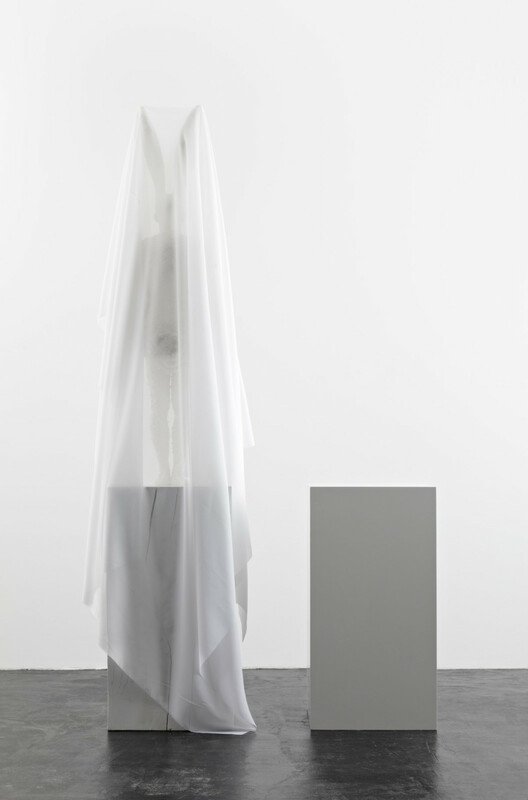 Terence Koh: yes time is all the same illusion to me. so yes same boy, same time. but not kohbunny, this work for yokohama and the drawing is terence koh. TK: again nothing to do with kohbunny. that is a website. just terence koh. i like rabbits. and the ears make everything more dramatic. the piece is about drama. actions. movement. 3. Are there any real pearls among the faux pearls? TK: i of course would love to do it all out of real pearls. but i would rather donate the money if i were to use real pearls to saving sea turtles. 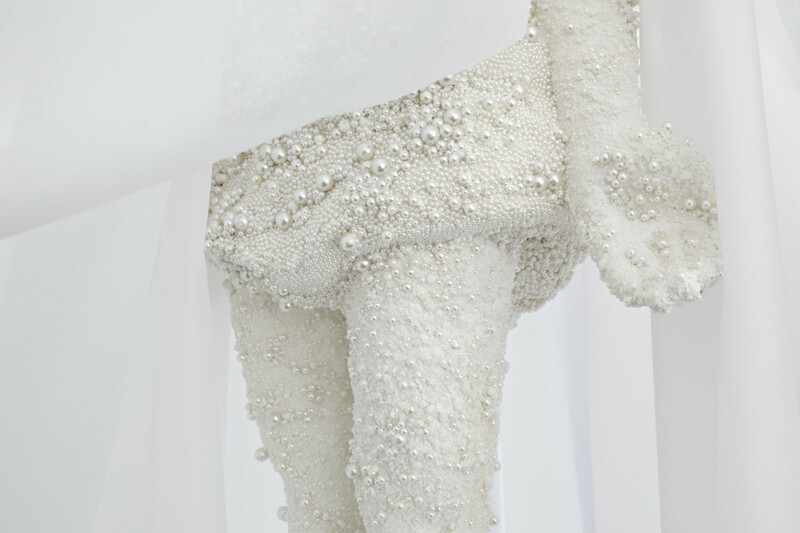 but research proved that all the pearls in this piece even if not “real” pearls from an oyster were created naturally from a blend of fishscales. 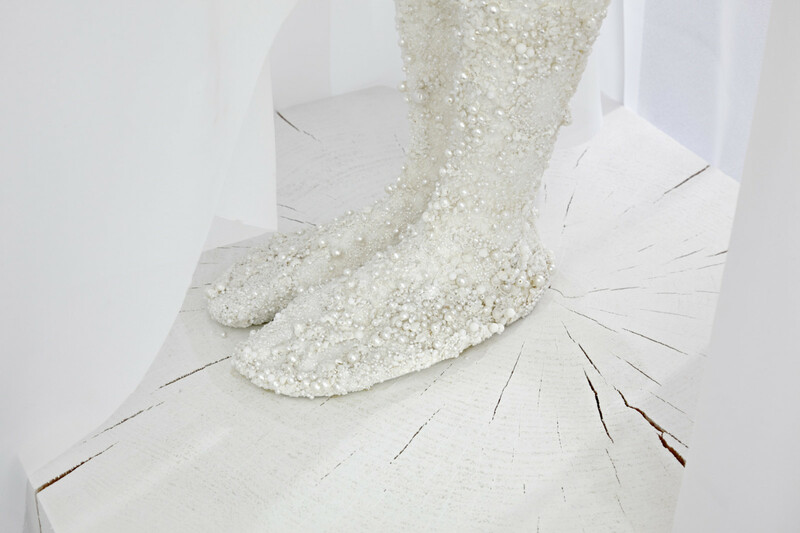 and i love the idea that the fishscales have become pearls and in the end they look like scales on my body. 4. What was it like having your body 3-D scanned? That means that there is now some digital form of your body, sort of like a DNA sequencing. Have you thought of selling this data? What is it like having a scan of your body that is in digital form? TK: i loved it. i love that i am preserved in 3D now in a form, and i want to distribute this information into the internet. so again its back to this idea of constant action and movement in the answer to my first answer. 5. Is the sea special for you in some way? Is Yokohama? TK: yes i love the sea more than most people. cause i am fearful of the sea, the darkness, the complete blackness. the bottom of the sea is the most perfect form of blackness and right down there is its equal, a pearl of complete whiteness. that pearl is hidden inside the mouth of this sculpture. and it talks for eternity to the empty plinth that is part of this piece. Javier Peres is pleased to present Terence Koh, “Boy By the Sea,” first presented at the 2008 Yokohama Triennial, exhibited now for the first time in Berlin. The sculpture was initially presented a few feet away from the sea in Yokohama as part of a site-specific performance, in the dark, flanked by two boys wearing loin cloths. 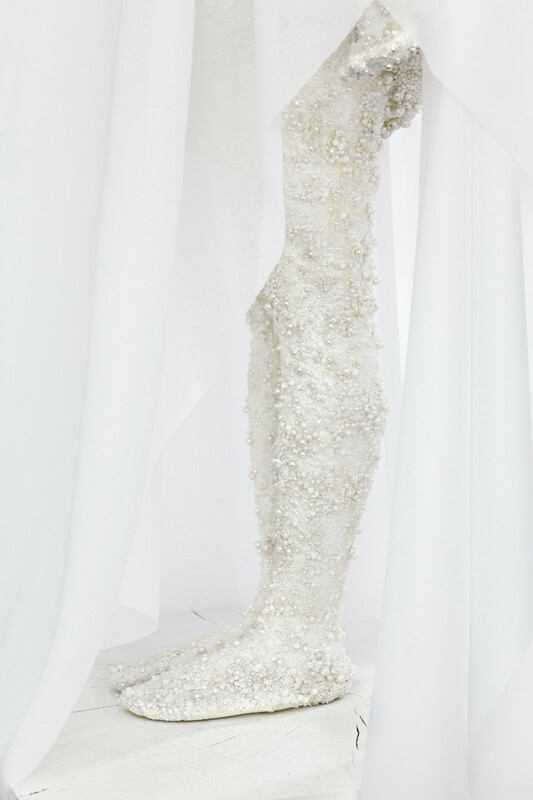 Terence Koh appeared, painted head to toe in white, and wearing a similar loin wrapping, to lead several boys in a procession, several of which carried the wood sculpture to the seafront, where it was placed atop its pedestal. He then climbed up to the sculpture, tied the ears of the sculpture with strings from his loin cloth, and then climbed on to the matching pedestal, wrapping the other end of the string several times around his mouth, thus creating a bridge between himself and his smaller, pearl covered alter ego. The boys then walked underneath the string bridge and one by one flung a pearl into the sea. Many know Terence Koh’s work for the heavy tasks it calls materials to perform: precious gold to encase profane feces, patina white to smother and equalize disparate objects (perhaps akin to the last scene of Joyce’s Dubliners, in the story “The Dead”: “His soul swooned slowly as he heard the snow falling faintly through the universe and faintly falling, like the descent of their last end, upon all the living and the dead.”), black glass, neon light, a saccharine but perishable chocolate trophy memorializing Michael Jackson; The most conspicuous medium in this work are 65,000 faux pearl and faux pearl fragments, each hand applied to his body to create a resplendant surface, somehow animalistic in its scaliness, yet sublime in its subtle variations of texture. Yet to stop at the materials and merely the web of references in the work all having to do with the sea/water/pearls, would overlook Terence Koh’s deep understanding of the power of the sea, both at its murky depths and its lofty heights in renditions of Western art, among them Gaugin’s drawing “Dramas of the Sea: Descent into the Maelstrom.” The drawing, an inspiration for the curators of the Yokohama Triennial, is itself a reference to Edgar Allen Poe’s story of the same name, in which a man, travelling with his brothers at sea, encounters a maelstrom. One brother is pulled ito the waves, the other is driven mad, and the protagonist ages from a young man to an old man overnight. The curators of the Yokohama Triennial see this as a jumping off point for a metaphor for the art experience, akin to plunging to the depths of a crevasse of time. 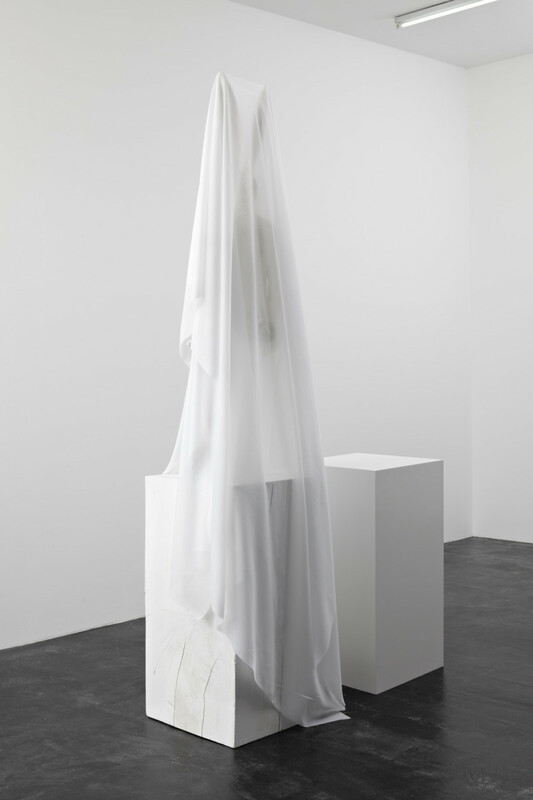 With this work, as with his 2008-2009 major solo exhibition at MUSAC, “Love for Eternity,” Terence Koh’s forays into self-eternalization knowingly tap into a common well of bedazzling thanatos to reveal the true nature of time, movement, and action. “Boy by the Sea” will be on view at Peres Projects (Schlesische Str. 26, 10997 Berlin) through June 13, 2009. Hours: Tuesday through Saturday, from 11:00 A.M. to 6:00 P.M and by appointment. For further information or reproductions please contact Margherita Belaief at +49 30 6162 6962, or Margherita@PeresProjects.com or Javier Peres at Javier@PeresProjects.com. Bei dem folgenden Text handelt es sich um eine Email-Austausch mit Terence Koh über seine 2008 entstandene Skulptur „Boy by the Sea”, die, in 2/3 seiner Originalgrosse, ein perfektes Spiegelbild von Terence Koh’s Körper mit 65000 Kunstperlen überzogen ist. Um diese Arbeit zu produzieren ließ Koh seinen Körper mit einem 3-D Scanner erfassen und war in der Lage mit den so erlangten Daten ein exaktes Replik seines Körpers in der Groesse zu machen, die er als Junge gehabt hätte. 1. Ist dies der gleiche Junge wie in der Zeichnung (von Dir) am Meer, welche schon mehrere Jahre alt ist? Ist diese jetzt in Form einer menschlichen Gestalt oder Kohbunny zurückgekehrt? Terence KOH: Ja, es ist alles dieselbe Erscheinung für mich. Also ja, der gleiche Junge, zur gleichen Zeit. Aber nicht Kohbunny, diese Arbeit für Yokohama und die Zeichnung sind Terence Koh. TK: Nochmals, es hat nichts mit Kohbunny zu tun. Das ist eine Webseite. Einfach Terence Koh. Ich mag Kaninchen. Und die Ohren machen das Ganze dramatischer. In der Arbeit geht es um Dramatik. Aktion. Bewegung. 3. Sind unter die Kunstperlen auch echte Perlen gemischt? TK> Natürlich wäre es toll, die ganze Arbeit mit echten Perlen herzustellen. Doch ich würde das Geld eher zur Erhaltung der Meeresschildkröten spenden. Aber Nachforschungen haben ergeben, dass alle Kunstperlen in dieser Arbeit, auch wenn sie nicht wie “echte” Perlen in Austern gewachsen sind, auf natürliche Weise aus einer Zusammensetzung verschiedener Fischschuppen hergestellt wurden. Und ich liebe die Idee, dass diese Fischschuppen zu Perlen geworden sind und am Ende an meinem Körper wieder wie Fischschuppen aussehen. 4. Wie war es, deinen Körper in 3-D scannen zu lassen? Das heißt ja, dass nun ein digitales Abbild von deinem Körper existiert, ein bisschen wie eine DNA-Sequenz. Hast du schon einmal darüber nachgedacht, diese Informationen zu verkaufen? Wie fühlt es sich an, eine Scan deines Körpers in digitaler Form zu haben? TK: Ich fand des toll. Ich mag es, dass ich jetzt in 3-D konserviert bin, und ich will diese Informationen über das Internet verbreiten. Dies bezieht sich also wieder auf die Antwort auf die erste Frage-die Idee ständiger Aktion und Bewegung. 4. Hat das Meer eine besondere Bedeutung für Dich? Oder Yokohama? TK: Ja ich liebe das Meer wohl stärker als die meisten Menschen. Weil ich vor dem Meer Angst habe, seiner Dunkelheit, der absoluten Schwärze. Der Meeresgrund ist die perfekteste Form dieser Schwärze und genau dort unten gibt es auch sein Gegenstück, eine Perle in vollständiger Weiße. Diese Perle ist im Mund der Skulptur versteckt, und sie spricht für alle Ewigkeit zu dem leeren Sockel, der Teil der Arbeit ist. Javier Peres freut sich sehr, Terence Koh’s Arbeit „Boy by the Sea”, 2008 in der Yokohama Triennale gezeigt, zum ersten Mal in Berlin auszustellen. Die Skulptur wurde ursprünglich in Yokohama als Teil einer in situ Performance gezeigt, im Dunkeln, flankiert von zwei jungen Männern in Lendenschurzen. Terence Koh, von Kopf bis Fuß mit weißer Farbe bedeckt und ebenfalls in einem lendenschurzähnlichen Gewand, leitete mehrere Jungen, welche die Holzskulptur trugen, in einer Art Prozession zum Meeresufer, wo diese die Skulptur auf einem Sockel ablegten. Er kletterte daraufhin auf den Sockel, band die Ohren der Skulptur mit einem von seinem Lendenschurz hängenden Seil zusammen und kletterte dann auf einen zweiten Sockel. Er band das andere Ende des Seils mehrere Male um seinen Kopf und schuf so eine Art Brücke zwischen seinem Körper und dem kleineren, perlenbedeckten Alter Ego. Die Jungen liefen dann unter dieser Seilbrücke her und warfen einer nach dem anderen eine Perle ins Meer. eine zuckersüße aber verderbliche Schokoladentrophäe, die Michael Jackson zum Denkmal gesetzt ist. Das auffälligste Material in dieser Arbeit sind die 65000 Kunstperlen und Kunstperlenteile welche, jede von Hand an seinen Körper angebracht, um eine glänzende Oberfläche herzustellen, auf eine Art animalistisch in ihrer Rauheit und doch sublim in den feinen Variationen ihrer Oberflächen wirken. Orientierte man sich in dieser Arbeit nur an den Materialien und dem Netzwerk der Referenzen zu Meer/Wasser/Perlen würde dies dazu führen, dass man Terence Kohs tiefes Verständnis von der Kraft des Meeres, sowohl in seinen dunklen Tiefen also auch seinen luftigen Höhen in Repräsentationen westlicher Kunst, wie z.B. in Gaugins Zeichnung „Dramas of the Sea: Descent into the Malstrom”, außer Acht lässt. Die Zeichnung, die den Kuratoren der Yokohama Triennial also Inspiration diente, ist selbst eine Referenz zu Edgar Ellen Poes Geschichte „Im Wirbel des Malstroms” in der ein Mann, mit seinen Brüdern auf See, in einen Malstrom gerät. Einer der Brüder wird von den Fluten hinweg gerissen, ein anderer in den Wahnsinn getrieben, und der Protagonist wird über Nacht von einem jungen zu einem alten Mann. Die Kuratoren der Yokohama Triennale sahen dies als einen Ausgangspunkt für eine Metapher der Kunstbetrachtung, ähnlich wie der Sprung in die Tiefen einer Zeitschleuse. Mit dieser Arbeit, wie auch mit der 2008-2009 durchgeführten aufwendigen Einzelausstellung „Love for Eternity” im Museo de Arte Contemporáneo de Castilla y Leon, setzt Terence Koh das Spiel mit der eigenen Unsterblichkeit und der Verführung des Thanatos fort, um die wahre Natur von Zeit, Aktion und Bewegung zu entdecken. „Boy by the Sea” ist bis zum 13. Juni 2009 bei Peres Projects (Schlesische Str. 26, 10997 Berlin) zu sehen. Öffnungszeiten: Dienstag bis Samstag von 11.00 bis 18.00 Uhr und nach Vereinbarung. Für weitere Infos wenden Sich sich an Margherita Belaief (030 6162 6962) oder Margherita@PeresProjects.com, oder Javier Peres (Javier@Peres Projects.com).